Now available to all GrabAllStars driver-partners nationwide! We have a special discount just for you! 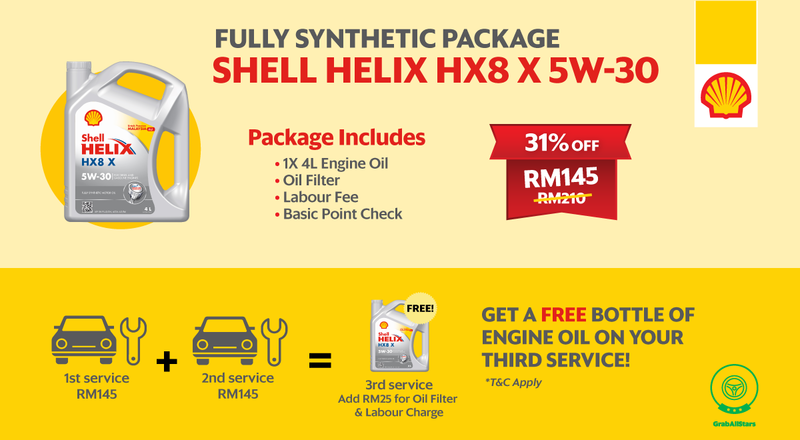 Shell is offering all driver-partners an exclusive service package that includes one bottle of Fully Synthetic Shell Helix HX8 X 5W-30 engine oil, oil filter, labour fee and basic point checks for just RM145 (N.P. RM 210)! *This service package is only available at Shell-appointed workshops. On your third service with Shell, you will only have to pay RM25 and receive a free bottle of engine oil! Click here for more information and the complete list of Shell-appointed workshops.